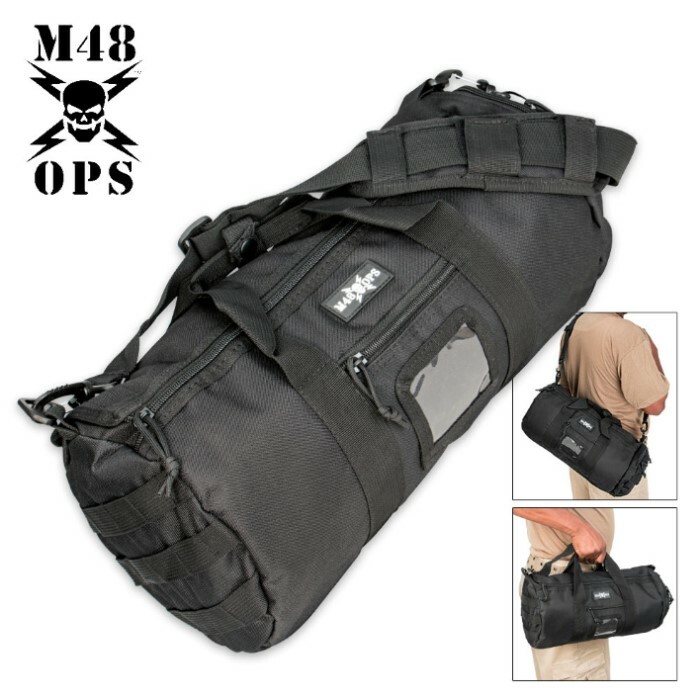 M48 Gear Tactical Military Overnight Duffle Bag Black | BUDK.com - Knives & Swords At The Lowest Prices! Pack your stuff up solider-style in this M48 Gear tactical military overnight duffle bag. The heavy-duty nylon canvas construction is rugged and durable for years of good use. 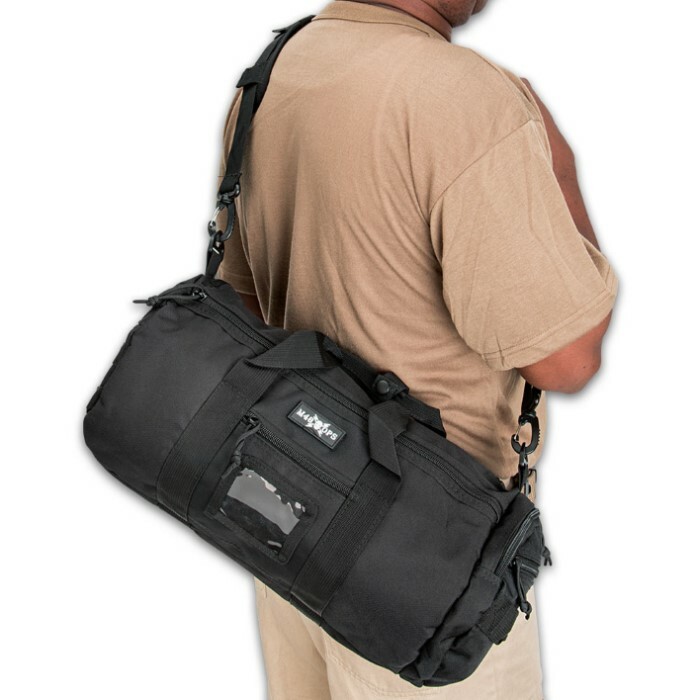 This tactical military overnight duffle bag also features MOLLE webbing, multiple zippers and pockets and a clear pocket for a nametag or ID cards. A padded adjustable shoulder strap and rolled handles provide for ease of transport. I ordered this bag to use as a small luggage when I'm out of town But the bag was a little smaller than I expected , so I'm just going to use it to hold all my knives instead. But overall this is a great bag with great quality, definitely no regrets buying this one ! 2 zipper pockets on one end, three rows of MOLLE webs on the other end and all along one of the long sides; zipper pouch and ID window on the other long side. I was surprised by the pockets on the interior of the long sides. In the interior, on the ID pouch side there is an almost full-length velcro pocket made of the same heavy-duty nylon canvas, divided into two sections. On the other long side of the interior there is another nearly full length mesh pocket with velcro closure; lots of possibilities! Handles appear to be sturdy and well stitched. Main pocket flap is secured by two parallel zippers and a velcro patch on the end. Pretty cool! Would like to find its big brother tho.